Is Real Estate right for you? Take our candidate questionnaire to find out! Are you looking for an exciting new career with unlimited earning potential? Then join our team of experienced dynamic real estate professionals in a positive work atmosphere. We offer a free 12 week intensive sales training course and one on one weekly coaching and mentoring. Royal LePage is constantly offering marketing and technology training and upgrading for our agents at no cost. We provide co-listing when you start and provide hands on training with listing presentations, buyer showings, marketing, negotiations, open houses, and much more. Our established office offers guaranteed listings and referrals for all new agents to help you get going. We also have a team of commercial specialists if this is where your interests lie. Everything you need to manage and grow your business is available through our rlpnetwork.com and Royal Lepage University to help you with all your professional developement. Royal LePage hosts a number of world class events that help you network and be recognized for your accomplishments. Looking to start at the top? 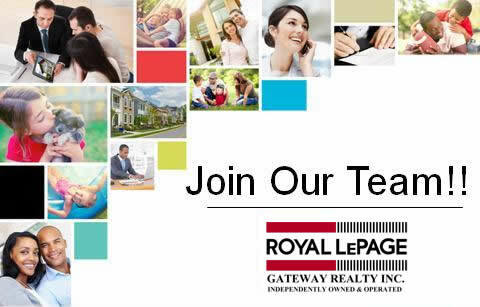 Contact us now at our Beaumont office 780-292-8600 or Leduc office 780-986-8407 at Royal LePage Gateway Realty to expand yourself personally, professionally and financially and jumpstart your career!